Claire Everett is founder and editor of Skylark Tanka Journal, as well as Skylark Publishing, both based in Yorkshire, Northern England. Her second collection of tanka, The Small, Wild Places, which contains 157 individual tanka plus four tanka sequences, was released by Skylark Publishing in 2015. The poems were selected and sequenced by David Terelinck, author of Casting Shadows and Slow Growing Ivy, who also wrote the in-depth foreword. The book concludes with brief commentaries by Susan Constable, tanka editor of A Hundred Gourds, and Joy McCall, author of four poetry collections including Hedgerows: tanka pentaptychs. The gorgeous matte cover was designed by Claire’s son Owen Smith. And just as the poet instilled her own love of words within her son, she blesses all of us—by sharing epiphanies revealed as she looks deeply and with gratitude into every-day wonders. I believe we are fortunate indeed that Claire’s heart overflows, that she is a poet deeply sensitive to nuance and nature, that her writing is lyrical and poignant even when describing the pain of a broken relationship. And we are fortunate that her poems shimmer with the awareness of spiritual mysteries yet remain accessible, that she is blessed with the ability and courage to express what is often inexpressible. will you go first, or I? 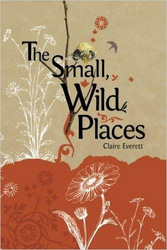 I heartily agree with Susan Constable that Claire’s tanka are stunning and magical, “brimming with emotion and metaphor...just the way I like them,” as she writes so aptly in her commentary in The Small, Wild Places. Words and images so exquisite, so breathtaking, so redolent that I cannot help but burst into tears. In fact, I keep tissues nearby when reading Claire’s work, both the poems and the poetic prose. The music and fragrance of her writing affect me profoundly. And the themes she addresses—love and loss, mothering her children, falling in love later in life, learning to trust again, losing (and finding) oneself in the natural world—resonate deeply for me. Despite these down-to-earth themes, I find her writing spiritual and transcendent, an antidote to the often ugly realities of human existence. Still, I’m not reading to escape this world, but to perceive the numinous as she paints it, the unseen but real world as it truly appears beyond our illusions of separation. Some may be disappointed to have found here no critical discussion, no dissection of individual poems. Instead, I celebrate The Small, Wild Places on the visceral level as an emotionally evocative reading experience—the best kind, in my opinion. But if pressed, the only criticism I might offer is this: None of Claire’s marvelous tanka tales appear in this book. On second thought, could it be that she plans next to publish an entire volume of her haibun and tanka prose? If so, then count me among those first in line to buy it! No doubt another fine addition to my collection of her books. Oh wait, I think I did already. She recently released through Skylark Publishing Talking in Tandem, co-written with her husband, Tony Everett. The book is a collection of her tanka, haiku, tanka prose, and haibun interspersed with Tony’s often wry narratives on learning to ride their tandem bicycle (Tallulah) together, which I also bought and plan to review soon. I look forward to Claire’s next volume of tanka prose and haibun as well. My appetite for her writing is voracious. For anyone who adores distilled yet intensely expressive poetry, The Small, Wild Places is simply a must-have. Such a beautiful creation, artistically designed and masterfully written. My recommendation: Please buy a copy for yourself, post-haste—plus extras. They would make lovely gifts. is Editor-in-chief and publisher of KYSO Flash, and an assistant editor for the Best Small Fictions series of annual anthologies (Queen’s Ferry Press). She has also served as copy editor and webmaster for Serving House Journal since its creation in 2010, and is a co-editor of Steve Kowit: This Unspeakably Marvelous Life (Serving House Books, 2015). Her short fiction and essays appear in Firstdraft, Bricolage, and Serving House Journal, and her essays appear in the anthologies Best New Writing 2007 and Winter Tales II: Women on the Art of Aging. Her nonfiction won an Eric Hoffer Best New Writing Editor’s Choice Award and was nominated twice for a Pushcart Prize. Ms. MacQueen and her husband Gary Gibbons design and build custom websites. They also share avid interests in sci-fi movies, flower gardens, and urban beekeeping.